Highlight sophisticated transitional style with this dining set. The 48" round dining table features a glass top and curved single pedestal base. Fully upholstered parsons chairs promise comfort and refinement, while also providing an easy-to-clean surface. The Matinee 5 Piece Dining Set with Parson Side Chairs by Steve Silver at Walker's Furniture in the Spokane, Kennewick, Tri-Cities, Wenatchee, Coeur D’Alene, Yakima, Walla Walla, Umatilla, Moses Lake area. Product availability may vary. Contact us for the most current availability on this product. Case Detail Sleek tapered legs. Description: Top Round beveled/tempered glass table tops. Contemporary styling reaches a whole new level with the fusion of the rich finished hardwood and elegant glass table top of the Matinee dining room collection. 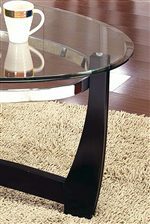 The rich almost-black finish covers the contemporary styled tapered legs and sturdy cross slat stretcher which supports the elegance of a polished bevel edge glass table top. With comfortable and stylish upholstered chairs, and standard and counter height options, this dining room collection captures the beauty of true contemporary design. Also a 3-pack of modern occasional tables are featured that match the dining room table. Enhance your dining experience with the rich design of the Matinee dining room collection. The Matinee collection is a great option if you are looking for Contemporary furniture in the Spokane, Kennewick, Tri-Cities, Wenatchee, Coeur D’Alene, Yakima, Walla Walla, Umatilla, Moses Lake area. Round Beveled/Tempered Glass Table Tops. Browse other items in the Matinee collection from Walker's Furniture in the Spokane, Kennewick, Tri-Cities, Wenatchee, Coeur D’Alene, Yakima, Walla Walla, Umatilla, Moses Lake area.